"We are doing a cultural exchange with a school in Nicaragua to send drawings and write about our respective schools and communities to learn more about each other. The students used iPads for research on our community, along with Google Maps and Google Earth for learning more about the geography of Nicaragua and Central America. We used the MacBooks for a great web site that has interactive animation about places in a city and asking/telling directions in Spanish. ..It's been great so far!" This gives the option of when you are typing to hit the icon that looks like a globe on the keyboard and then the keyboard goes to a Spanish keyboard. Great for all the accent marks etc. and easy to switch back and forth. 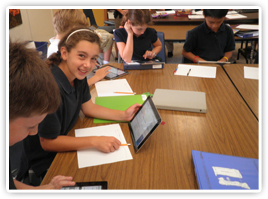 San Domenico School has a 1-to-1 student iPad program in Grades 6-12, a cart of iPads in Grade 5, and iPad or MacBook centers in Kindergarten-Grade 4.